The last while our Children's Literautre Roundtable has been collecting books for our local Single Parent Association. 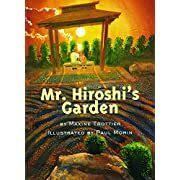 Sorting through boxes of books, I have come across several old favourites, one of which is Mr. Hiroshi's Garden by Maxine Trottier with illustrations by Paul Morin. As a child, Mary comes to stay with her grandmother on the west coast. Mary discovers that Mr. Hiroshi, her grandmother's neighbour, has a most unusual garden; a garden of gravel paths and stepping stones, clipped evergreens, and blue irises surrounding a koi pond. "I began this garden before you were born...I started with one flower and a few perfect stones. Such things take time. But a garden must begin somewhere." Mr. Hiroshi explains to Mary. Then, one day Mr. Hiroshi who was born in this country and lived in the same house his whole life, was taken away to an internment camp. Mr. Hiroshi and his garden became casualties of a WWII even though they were far removed from the crack of gunfire or the explosion of cannons. Before the new neighbours move in though, Mary and her grandmother rescue the koi and dig up a few of the precious irises. Mary also pockets a single stone. Later when she goes back to her prairie home, she begins a new garden for Mr. Hiroshi. "It was a small thing. But then, a garden must begin somewhere." I love Mr. Hiroshi's Garden. I love the rich but spare language. I love the illustrations which are equally rich in tone, content and perspective. I love it that a book about a garden can bridge cultural gaps. I love it that a book about a garden can bridge generational gaps. I love it that a quiet book about a garden can teach so much about tolerance and in so few words. If you've never read it, today would be a good time to pick up Mr. Hiroshi's Garden.